Ahem… Welcome! Dernicus here with another After Action Report, this time for our recent sold out 40k RTT: Warp Breach. Held at Event Horizon Games in Garner NC on March 26th, we had a packed house of 34 players from across 3 states compete. This was our second sold out event, right on the heels of our Bolter’n the New Year event back in January (at 44 players then). First off, it goes without saying that we’re immensely humbled and excited to see so many players turnout for these events. We can only strive to continue to make our events worth y’alls attentions. With LVO just a few weeks before and Adepticon a few weeks to come we knew this was going to attract a lot of competitive players. As such, we opted to use the ITC championship missions (1, 2, and 3), as well as the “Magic Boxes” terrain rules as introduced at LVO. Furthermore, in an effort to contribute to the call for testing, we included the BETA deployment rules for Mission 2 (also known as the Chapter Approved 2019 method). Everything else was pretty standard: MAX 2000 pt armies, MAX 3 detachments, Battle-Forged. Authors note: we tried something new, allowing Player Registration on the BCP event, but it caused some snags with our Pre-registration sales and the limited space available to us. We’ve talked it over and, while still using BCP for pairings and ITC score reporting, we’ll hold off on the player registration aspect for the time being. 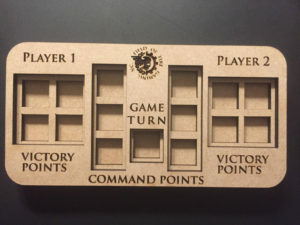 For the first mission, 6 pre-placed objectives covered most of the board. The bonus objective was to hold any 5 of the 6 placed at the end of a player’s turn. This mission used the current Alternating Deployment method and featured all of the available Secondary Objectives to choose from. Another aspect of this event was the inclusion of the BETA Secondary Objectives for players to choose from. Engineers (the same as NOVA for those familiar with that event), Gang Buster, and King of the Hill were all possible to choose. With so many objectives, Engineers appeared to be a crowd favorite as a Secondary Objective. Through the wisdom of the BCP app, the pairings were interesting, with Tau v Tau, Eldar v Eldar, and Ork v Ork. With groups of 3-6 from several gaming groups, we still managed to avoid any 1st round pairings within group (a setting in BCP in the past, but not obvious now). Eldar, Tau, and Guard-soup lists all did the best, likely mixing up hard hitting/hard to hit units with either longevity or a devastating early game lead. On the same token, Eldar and Guard also took the greatest beatings. Those that did not succeed were mostly in matchups against overwhelming early game pressure and the lack of longevity to take objectives or kill enemy units as the game continued. It should be noted that the distribution of lists saw 9 Eldar (be it Ynnari, Drukhari, or Craftworlds) and 7 Imperial lists (using Guard, or Guard + Knights, or Guard + Knights + Deathwatch). So it makes sense that those two factions will feature predominantly. This mission included 3 player placed objectives (truely 2 placed and the 3rd was set at the center of the table). This was the test mission for the Chapter Approved 2019 method of deployment: Each player deploys their entire army at once vs alternating. The player that deploys first gets to choose to take first turn (unless their opponent seizes). The bonus point was awarded to a player who holds the center objective and their opponents. Strangely enough with the fallout of Round 1 we saw a number of interesting matchups in this round as well: 2 of the 3 Space Wolves players facing one another, one of the Genestealers facing an Ork Horde, the other Ork Horde staring down the guns of a Tau suit list. The responses on the “new” deployment style were pretty neutral. Chief amongst the commentary was that it sped up deployment. Once again, Tau and Guard scored highly in this round, as did several imperial lists. One of the two Ork lists also nearly maxed this round as they did round 1, setting the tone for their final placements. Tyranids, Armored Co Guard, Craftworlds Eldar, and Knights all were found wanting this round. A large part of these results came from the matchups and whom went first. A centrally located objective and some serious alpha strikes all caused these lists to be on their back feet early on, unable to recover. For the final mission, there were 4 objectives, placed along the center lines of each table quarter. The bonus was to hold all 4 objectives (appropriately difficult for a final mission). With the competition tight, we had several high scoring lists duking it out for supremacy. Orks faced Tau (both Ork players), Guard faced Knights, Genestealers faced Eldar, all striving for the final stretch of points. But despite the strong competition and nearing the end of a long day spirits were high at all levels. Drukhari rose to the top, along with Orks (nearly maxing), Genestealer Cult, Ynnari, and Imperial (assault) soup. Deathguard, Tyranids, and Ynnari took the largest licks, struggling to score either due to the mission layout or matchups. With a slight delay in starting, we still managed to get 34 players locked in combat and done on time. In the end, Drukhari, fielded by the Dark Archon Chris Blackhamn himself, took our Warmaster (best overall) award. Chris has played the Dark Kin for nearly all of 8th edition and it shows in his handling against all manner of foes (Space Wolves > Ynnari > Imperial (shooting) soup). Astonishingly, with only 2 points behind, Orks took the Primarch (Best General). The list was only a handful of points short of maxing out and was exceptionally well painted. Facing another Horde, followed by two of the 4 Tau gunlines was no small feat for da green boyz. We had 27 out of 34 armies fully painted to 3 color, with several in strong competition for Best Painted. The Final prize went to Josh Kinder of Wobbly Modelers for his impressive Imperial Knights list. It included everything from LEDs, conversions both in the models and bases, and some amazing freehand on all of the Titans. Check them out here if you’re interested in seeing more of Josh and the other WMs work. Other shoutouts include Dark Bunny Creatives for their own Knights (and the massive display), as well as FireStorm Miniatures and Painting for Brooke’s amazing Space Wolves. It was an awesome day, with a lot of strong competition but a lot of laughs as well. A huge shoutout to Beats Lab Gaming for not only bringing a crew of gamers to attend, but also helping out with a few tables and associated terrain. Check out their events, as we always have a good time there too. The final tall (awards) ceremony can be found here! SHOUT OUT: Check out Tony Pierce, fellow Genestealer Cult brother, break down his games HERE! If you haven’t already seen it, our next event is scheduled for April 13th, and the event can be found here. Lastly, here are some links to major events coming up, courtesy of our many friends in the Warhammer Community: Barnyard Brawl Con (April 26th-28th, Greenville SC), Warzone: Atomic Empire(SOLD OUT)(May 18th-19th), Carolina Crusade (June 15th-16th, Charlotte NC).